Wishing you a Happy New Year and hope your 2010 is a bright, colorful and a productive one! I photographed this intimate scene late one morning after I waited on some alpen glow that never showed but kept at it until I found something I was pleased with. This entry was posted on January 4, 2010 at 5:16 pm and is filed under Uncategorized. You can follow any responses to this entry through the RSS 2.0 feed. You can leave a response, or trackback from your own site. 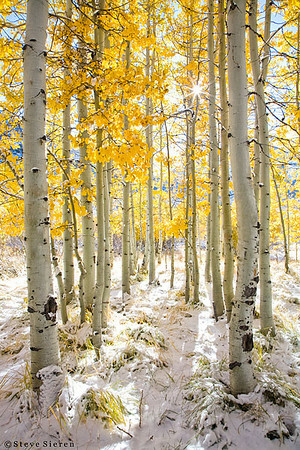 I really love the dusting of snow over the yellowed grass foliage and golden aspens… and the touch of blue sky. Wonderful colors and great to have the scene backlit! A lesson I learn from you and other photographers I admire. Patience. Persistence. = Payoff. Happy New Year to you as well, Steve! Looking forward to the great things in 2010!!! Love the wonderful golden yellow glow of those leaves…. great! Thanks guys! I’ll try to keep you learning from the web Debi. Hope you all had a great one!